Part of our yearly holiday excursion to the fair city of New York and it's surrounding boroughs has recently begun to include a day trip into Manhattan for exploration. Usually with no real plans ahead of us, this year we decided to be a bit more strategic with our day, especially since we were headed out in post-Blizzard 2010 slush, and so navigating the city streets would be more time-consuming than normal. I have had a love affair with these DK Eyewitness books ever since I wore out a copy while studying abroad in Madrid, Spain. Their small-ish size means they can easily fit into your winter coat pocket (for the men) or a regular-sized ladies purse. Some editions feature bonus pop-open maps, and in the NYC edition, this includes subways. Ingeniously, they include numerous Top 10 Lists that detail out the "Top 10" whatever you should go see while in town, be it cafes, museums, parks, historic monuments or more. One of my favorite features of these guidebooks is that they lay out plans for different neighborhoods in a city so that you can make a whole day of a district, hitting each of the hot spots while navigating the turf on foot. None of us kids had spent any amount of time in Battery Park, so we knew we'd inevitably end up down there, seeing the park, Trinity Church and perhaps a museum. We're sure you have your own favorite falafel joints. And yet, as with a bagel or a chocolate chip cookie, there's an enormous difference between a falafel sandwich that's satisfying—crispy falafel balls, soft pita, enough hummus or tahini—and a falafel sandwich that's the best in New York. So off we went. Off an unnoticeable side street in the West Village, just a stone's throw from the famed Magnolia baker's dozen, Taim Falafel claims a tiny storefront with only 6 stools along it's window for seating. But don't let this fool you. 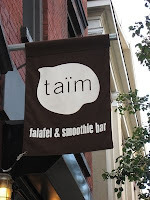 Taim (written with two dots over the "i" that I can't recreate here in Times New Roman) packs in the crowd; even if most people have to take theirs To-Go and eat falafel goodness on a stoop somewhere nearby, the experience is 100% worth it. We each tried a variety of their falafel - the green (traditional chickpeas plus parsley and other herbs), the red (made with red pepper, omg so good) and the yellow (made with spicy harissa). Each one had it's own flavor, and melds with the fresh flatbread, the creamy tzatziki sauce and hummus, fresh salad and maybe some feta for added flavor ... Oh my goodness, we scarfed ours down ASAP despite sitting in some snow-entrenched park with no cleared bench to be found. 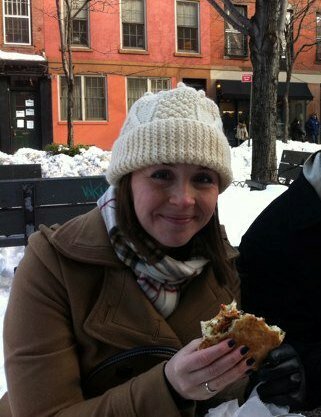 What is your favorite falafel place, either here in Atlanta or in New York City? Have you tried Taim before?